One of the biggest concerns for customers involves the challenge of attaching and detaching tractor implements. John Deere listened to customers and addressed the problem with the iMatch Quick-Hitch available for the 1025R Sub-Compact Utility Tractor. The front Quik-Tatch™ hitch makes changing front implements quick and easy. Imagine taking off and putting on the AutoConnect mid-mount mower decks, D120 and H120 Loaders or the 260 Backhoe within 5 minutes. No additional tools are necessary. Start changing your rear implements in a snap with the iMatch Quick-Hitch, incorporating three fixed points to back in and pick up any compatible rear implement. The iMatch AutoHitch system also allows rotary cutters and tillers to be hooked up without you ever having to leave the seat of your tractor. Standard on the John Deere 1025R – 4WD and power steering. This combination allows operators to easily maneuver to have more productive days on the property. With a narrow width, the 1025R can work in tight areas where most compact tractors can’t even fit. The power steering means that less effort is required, especially when mowing around hurdles or when the tractor is equipped with a front attachment. 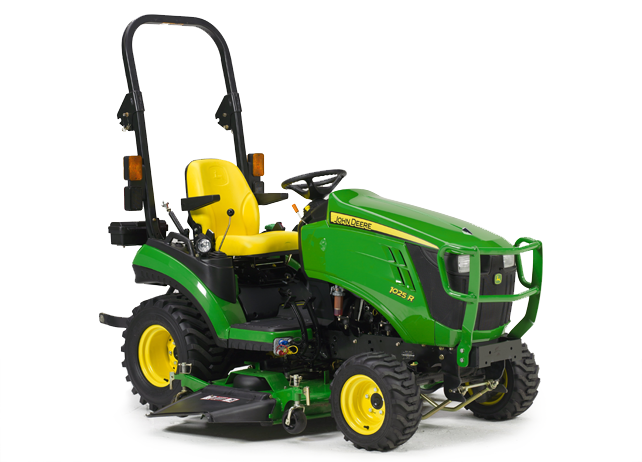 Because of the high horsepower, the 1025R is an ideal choice for a wide range of tasks, including mowing. This tractor has a Tier-4 Compliant isolated Yanmar® TNV diesel engine, which provides 24.2 horsepower, and 3200 rpm rated speed. Operators will experience strong hydraulics, a comfortable operator station and control, and versatile implements like D120 and H120 Loaders, AutoConnect, the 260 Backhoe, and iMatch AutoHitch. The John Deere 1025R operator station was designed to create a more comfortable and convenient experience on the field. The machine features a sloping hood design for improved visibility, large operator station, step-through textured flat operator station, controls located next to the fenders for convenience and much more. The 1025R Tractor features a hydrostatic transmission (HST). The hydrostatic-drive unit functions both as a clutch and transmission. With Twin Touch foot controls, operators can select both speed and direction of travel with just one touch of the toe. This feature is best for jobs where high productivity is needed like loader or mower applications. Experience infinite ground speeds, even when you’re at full throttle to finish the job. The best part? No clutching is needed for quick direction changes. 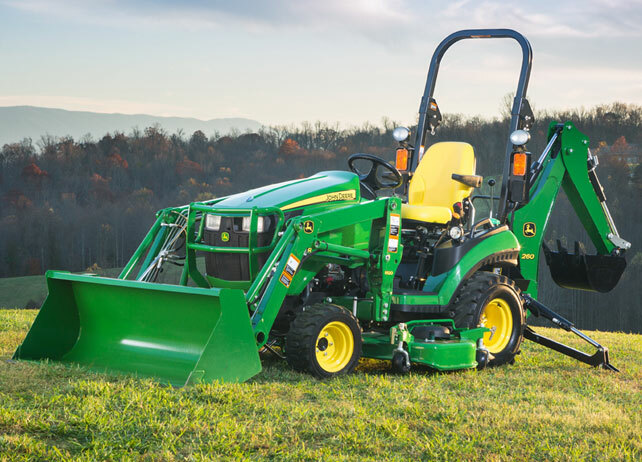 We hope this post provided some valuable information as you look into the utility tractor market on your way to purchasing your next piece of John Deere equipment.